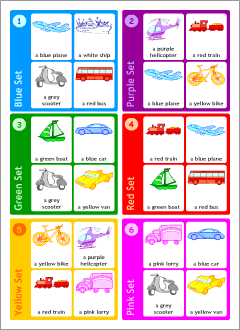 This is a board game with cards for 2 players (or teams) to learn talking about transportation in English. In this game, there is one person asking questions (Player Q) and the other person answering questions (Player A). You can play this game using a board with cards, or game boards only (one for each player). Decide who will be Player Q and Player A. Player Q gets a game board. Player A selects an envelope, takes out the cards and fans them in his or her hand secretly. 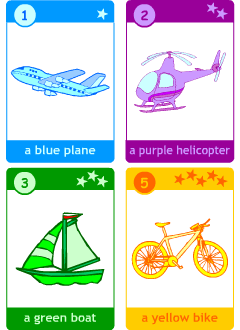 Player Q has to guess the secret set by asking yes/no questions, for example, Have you got a blue car? According to the given answers, Player Q eliminates the pictures on his/her game board until he or she finds out the secret set. The game can be played on two boards, one for each player. Player A marks his or her secret set of pictures, then Player Q tries to guess the secret set by process of elimination. One kid secretly chooses one of the six sets of pictures without telling their partner. The partner must guess which set has been chosen by asking Has you got...? and working out by elimination which set it must be.